I specialize in custom software solutions for business. Those business’s are usually manufacturers or technical workshops. I create custom software, designed and built to solve your problems the way you want it done. I can reach into data you already have – no matter how it was created. Extract, calculate, or change formats. Measure and monitor the real world via sensors. Communicate with devices – it’s my specialty! Collect new data from machines or humans. Produce reports from any data you have – in new and exciting ways. My teaching experience means I like training and creating training materials. Handy for making manuals for a something you build and sell. Build MYOB and Quickbooks multi-user installations that are solid! Take a look at the Projects menu on this site. This site is fairly sparse – getting it up to date has been taking a back seat to real work! SyringePumpPro – an application I sell the world over to Universities and business for use in research and manufacturing. TodoWhatWhen – a Todo application designed for business’s. It has special features like tracking tool calibration, publication updates, and generally reminding a business when periodical tasks need doing. – in development. Server Support – You almost never see me! I also build install and maintain Linux servers. I do a little server administration – and that’s because my servers run for months at a time with little or no intervention. 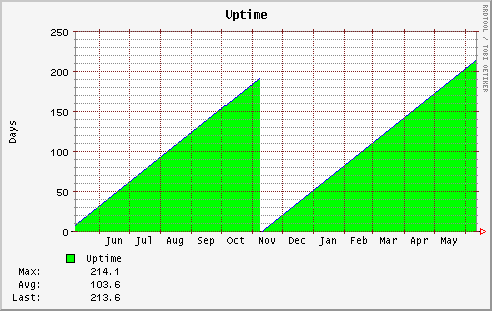 Sample Uptime from a server I maintain.